CONDO: This beautiful luxury condo is located on a one-half mile white sand beach, overlooking the crystal clear turquoise waters of the Caribbean Sea. Our unobstructed view of St John & Tortola from our 2nd floor balcony is PRICELESS! Our condo has been completely renovated with wonderful tile floors throughout, gorgeous granite kitchen countertop & backsplash, new stainless steel appliances, new sliding doors to balcony, unbelievable new bathroom with tiled shower and sitting bench, double granite sink vanity. The condo has new kitchen cabinets with plenty of storage space throughout. We have completely remodeled the living room with new furniture and newly appointed lighting fixtures, as well as new table & chairs for the dining area. We have 2 plasma flat screen TV's in the living room & bedroom.We offer FREE WiFi! 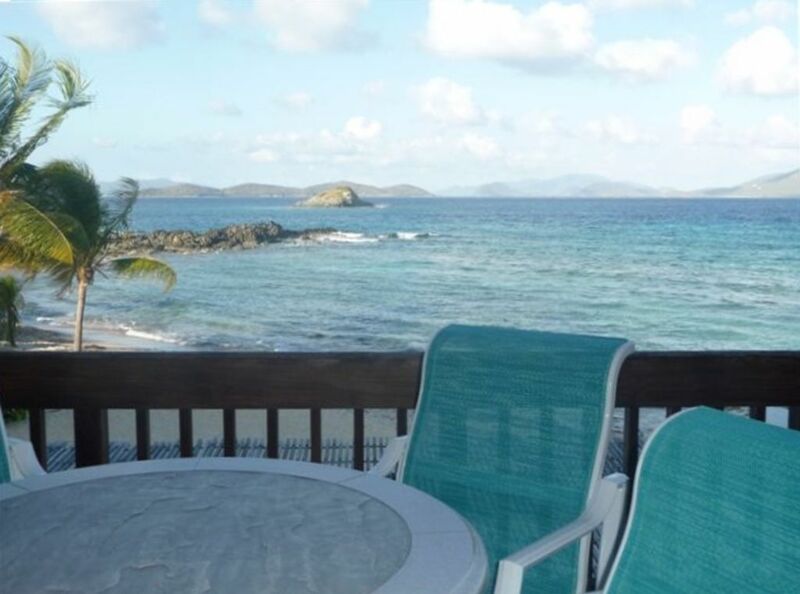 Enjoy dining in or eating out on the balcony while watching the moon rise over St John, as well as enjoying your morning coffee while watching the sun come up.During the day there is plenty to do...snorkle 40 feet from our condo, sun bathe on the beach or take a cool dip in our 2 tiered pool. For lunch, Sapphire Beach Bar & Grill just recently opened on our beach in July, 2016. Current hours of operation are 10:30 am-6 pm. Come enjoy a refreshing cold drink and get a a bite to eat without leaving our gorgeous beach. We also are next to the freshwater pool. Gaze out from the terrace at St. Johns and Tortola. It's such a wonderful place to be. No pressures, no dressing up just bring your bathing suit and unwind. BEDROOM: Our master bedroom has new king mattress & boxspring along with built-in storage and recessed lighting. Enjoy watching our 2nd flat screen plasma TV, with 68+ cable channels. THE ISLAND OF ST. THOMAS: St Thomas is a 32 square mile island in the Caribbean owned by the U.S., located below Puerto Rico. There is world class beaches and great duty free shopping at Charlotte Amalie. NAVIGATING AROUND: You can rent a car at the Airport or use local taxis. Taxi's are available at the taxi stand near the lobby on property. WHAT TO DO: Our condo is located in the D Building, a few hundred feet away from the 2 tiered pool and 40 feet from the water. We are less than a mile from Red Hook, where you can find shops, grocery stores, restaurants, and ferry docks to St John's and BVI's. Our property at Sapphire will offer you jet ski rentals, powerboats, parasailing or fishing charter or sails. Mahogany Run golf course is 20 minutes away and boasts the famous Devil's Triangle. Words cannot describe this priceless view of St John's and Tortola. Our view is totally unobstructed! Our condo is located directly on Sapphire Beach in the most desirable "D" Building with balcony overlooking the gorgeous white sands and tranquil blue waters. Condo equipped with state-of-the art energy eye which automatically sets comfort temperature to conserve energy. Two additional ceiling fans. Washer and Dryer available on-site. Brand new full sized stainless steel refrigerator/freezer. Full sized new stainless steel microwave. Our condo has 2 plasma tv's with cable with 68+ channels. New 42' flat screen plasma TV in living room and another flat screen in master bedroom area. There is a wonderful balcony with priceless views overlooking St John & Tortola. There is a brand new elevated table/chairs for 4, along with 2 beach chaises as well. Excellent location, condo has everything you need. There is a bar and coffee shop on property, both had amazing service and great food/drink offerings. We highly recommend this condo and this location on the island. Incredible views of Saint John and the BVI. Lovely apartment and setting. Dishes were not clean. This D209 condo was clean and updated with an exquisite view of the surrounding islands and water. The sargassum seaweed was invading the beach area outside of the E building but the pool and beach areas outside the A-D buildings were not effected. Loved the location of Sapphire Resort and Marina. We did rent a car to get around and I’m glad we did, we could explore on our own. Our host had towels and snorkel gear as well as a well stocked kitchen with whatever we may have needed. We fully enjoyed our accommodations and would gladly stay in D209 again. We really enjoyed our unit and building location at sapphire beach. We were a short walk to a small bar that had snacks and beverages. Red Hook was a 5 minute drive and easy access to ferry to visit St. John. Incredible view!!!! My husband and I stayed for 9 nights and enjoyed every minute of it. The unit was gorgeous and had everything we needed - kitchen was fully stocked with dishes, drink cups, cookware, beach mugs, etc. The bathroom was large, and there were plenty of bath towels as well as beach towels. Snorkel gear was in the closet, as well as a cooler we used all week. The 2nd tv did not work in the "bedroom" and Jeanne had it replaced by the next day (we like late night tv to fall asleep to!). We naturally woke up at 6 am every morning as the sun came up, and enjoyed the beautiful view of St. John. We both agreed the D building was ideal, as it literally sits right on the beach and you can look right down to the shoreline (bldgs A,B,C sit back behind the beach a bit). A 30-second walk to the end of the building leads you over to the main section of beach, which was a little busier but better for swimming, lounging, snorkeling (which was awesome over by the reef/rocks). The beach bar was fabulous and does indeed have the BEST Caribbean chicken sandwich I've ever had - pricey but worth it! The pool was nice, although we didn't spend too much time there, and if you read the other reviews you will hear about the boarded-up pool bar (true, but wasn't a big deal and we knew the situation ahead of time). The restaurant Slice, at the entrance to the entire complex, was fantastic - we ate there 3 times. Drove up the hill to get there the first night, but found the walking path later the next day. It was a short 2-minute drive to Red Hook, and we had fun hitting the bars and restaurants there. We went over to St John twice - once on the passenger ferry and once on the car barge so we could explore beyond the main town of Cruz Bay. I really have nothing negative to say about our trip and could go on and on about how beautiful everything is there! Thanks Jeanne, for such wonderful attention to detail in your condo! Thanks, you were a pleasure to host, please come again. Two-Tier Fresh Water Pool with Waterfall, One-Half Mile of White Coral Sand Beach. Waitress service available at Pool or Beach for Food & Refreshments.